This is the message that Grammy award winning singer Ella Marija Lani Yelich-O'Connor, better known as "Lorde," wants to share with her fans. Lorde, who is only 17 years old, is known for her strong voice, her New Zealand heritage and, of course, her black lipstick. But there is something else less glamorous that she's chosen to add to this list — her acne. Unlike some celebrities, who want the public to view them as their perfect photoshopped selves, Lorde does not feel the same. She recently posted a side-by-side comparison of herself on Twitter — the media-released photoshopped version and the real version. This made me respect her so much. I am not a celebrity, not even close, yet before I post any picture of myself on social media, I make sure to edit out my acne marks. 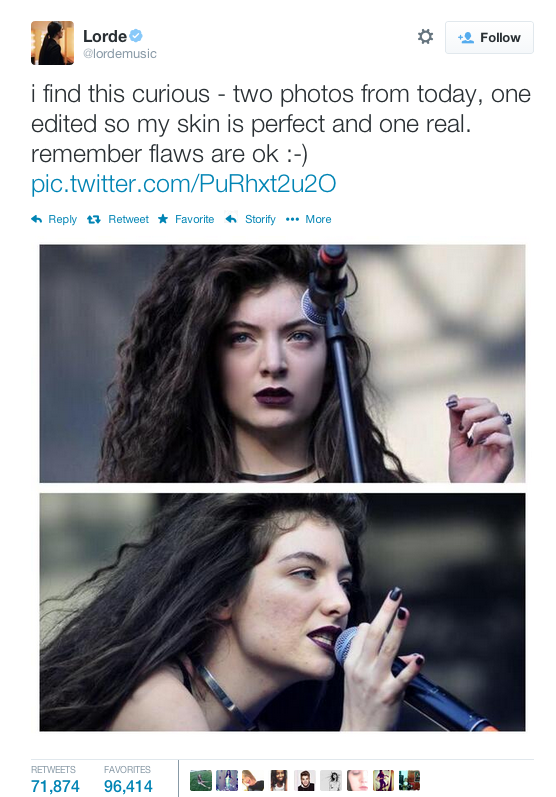 Yet Lorde is proud of the way she looks — blemishes and all. I wish I could be more like this. The next time you flip through a Hollywood magazine, don't compare yourself to the celebrities and the models that grace the pages. These are unrealistic ideals that the celebs couldn't even live up to themselves — considering, as Lorde has proven, the images aren't real. I love this description of "true beauty" on the Huffington Post. Writer Eliel Cruz said, "True beauty has flaws. It's the flaws that make us unique. Our flaws are what set us apart; they make me, me, and you, you. We are all different and so we are all valuable. YOU are worth something. And your value is intrinsic. You don't need someone else to validate you. Set your standards, set your goals, and achieve them for you. Not for anyone else." "(My flaws) are what make me, me. … Beauty comes in all sizes, colors, genders, and cultures. If you can't see that, you're beauty blind." I think music in itself is therapeutic. It's an quick-tempered appearance of humanity. It's impressive we are all touched by. 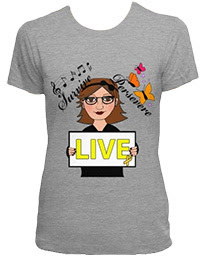 No matter what background we're from, everyone loves music world's most famous and popular language.